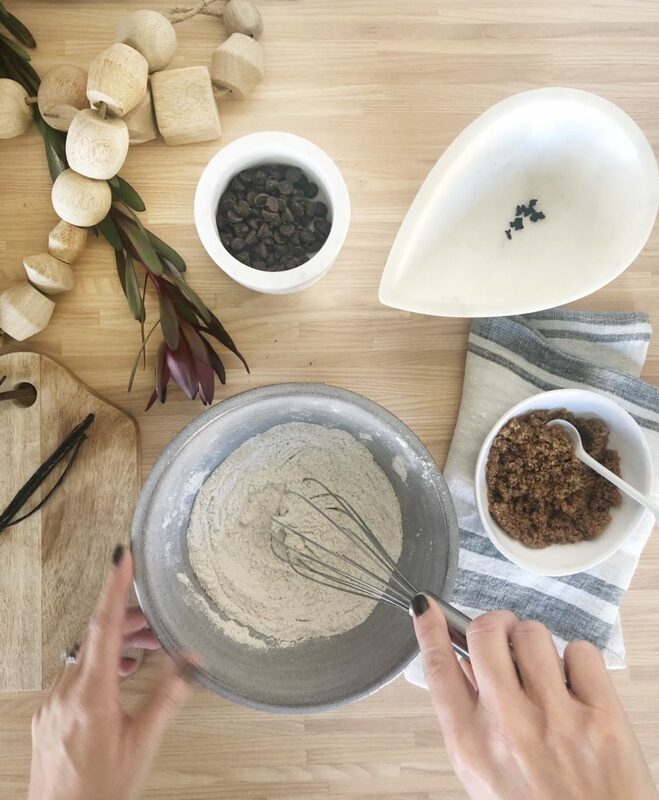 It is so fun to be part of this because normally no one would ever ask my thoughts on anything related to cooking (which is smart), but the truth is that I am a decent baker. So when Sara from Room for Tuesday invited me to be part of the Blog Hop Cookie Swap I was super excited. 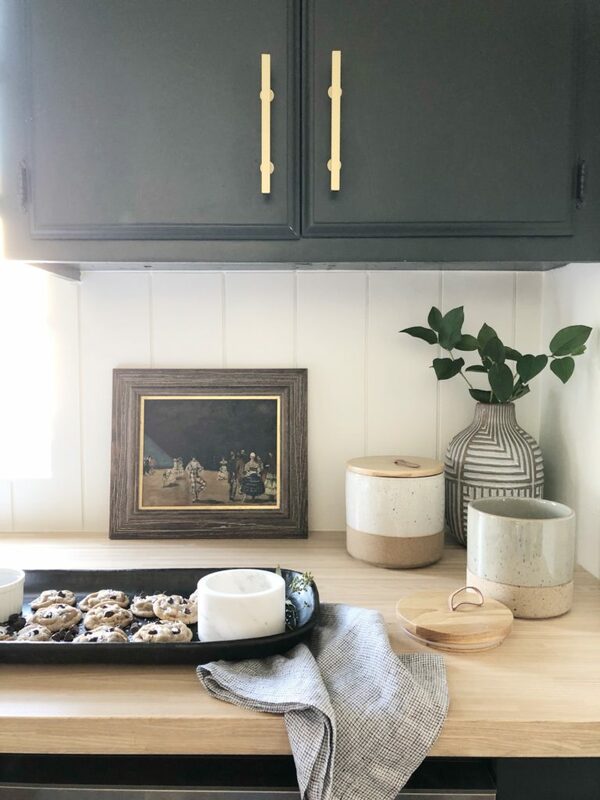 ONE, because she is rad and we once got tattoos together in San Francisco, and TWO, this is a way for me to share my fave cookies and newly facelifted kitchen at the same time! My pick for the cookie swap was the Salty Vanilla Bean Espresso Chocolate Chip Cookies. Are these cookies a super secret family recipe like the famous Bush’s Baked Beans? Absolutely not. I come from a long line of ladies with fabulous manicures, impeccable style, and absolutely zero culinary ability. I may not know how. 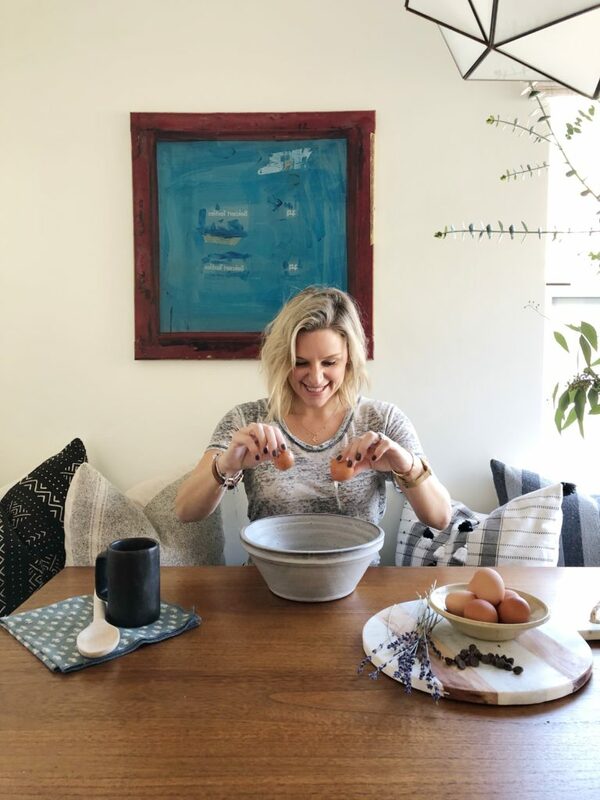 to hard boil an egg, but I do have a deep and dedicated love for sweets, which is how I found Christina Lane and her blog Desert for Two. I have tried a ton of her recipes, but this one is my favorite because it combines the only three things that really matter in life: carbs, caffeine, and chocolate. 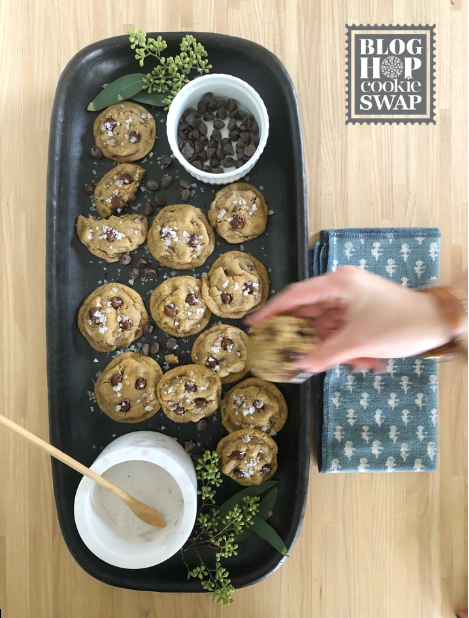 It’s a small batch recipe so it makes about a dozen cookies, which I think is perfect for the holidays since these are super rich and indulgent. 1. Preheat the oven to 375. 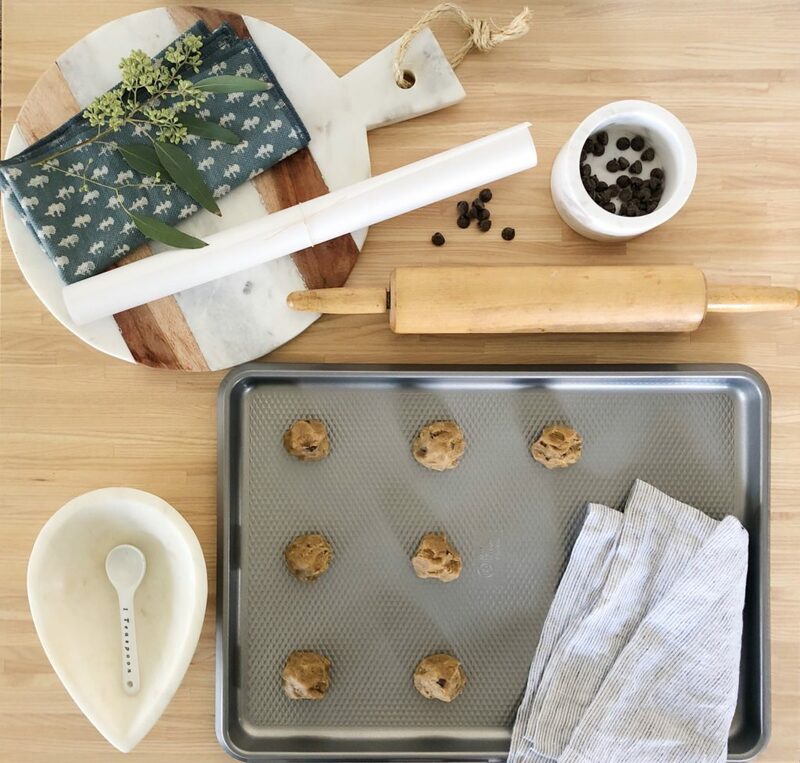 Line a baking sheet with a silicone mat or parchment paper. 2. In a bowl, beat the butter with an electric mixer on medium speed until fluffy, about 20 seconds. 3. Add the sugars, and beat for about 30 seconds. The mixture will turn a pale color and be fluffy. 4. Next, add the egg yolk and the insides from the vanilla bean, and beat until just combined. Above is me actually cutting a vanilla bean. Don’t mess it up because OMG organic vanilla beans are expensive. 5. Then it’s time to mix the dry ingredients. I’ve also included another gorgeous photo of my hands to once again prove I actually baked these cookies. 6. 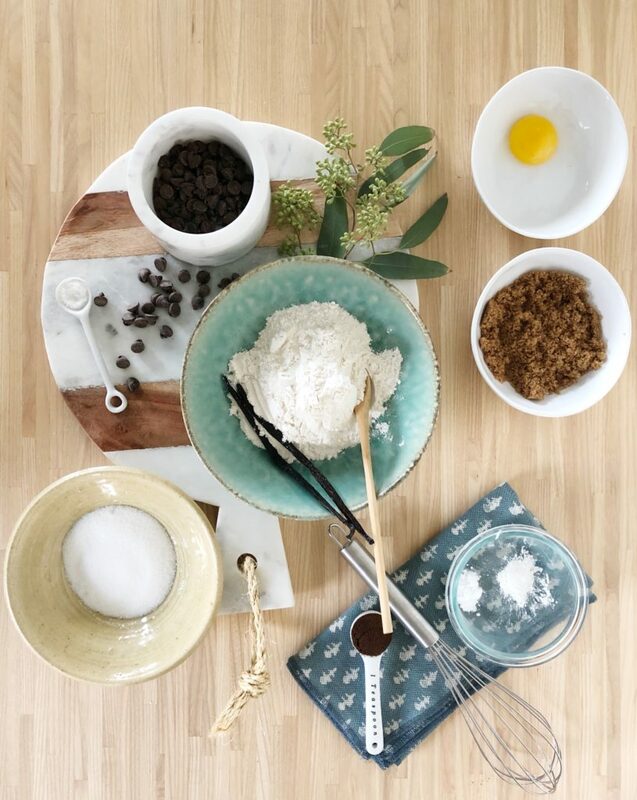 Whisk together the flour, salt, espresso powder, baking soda, and baking powdering a separate bowl. 7. Sprinkle the flour on top of the butter mixture and beat until just combined. It was right about here I decided the mixture still felt a little dry so I added another tablespoon of butter. 8. Stir in the chocolate chips. I also ate a few for good measure. 9. Scoop the dough into 12 dough balls, and space them evenly on the baking sheet. I didn’t have an ice cream scooper (gasp!) so I just used a tablespoon. 10. Bake for 8-10 Minutes, removing the cookies from the oven when the edges just start to turn golden brown. 11. Let the cookies rest on the baking sheet for one minute before moving them to a wire rack to cool. Right after I moved them I added more chocolate chips to the top because I obviously like to go rogue and love chocolate. 12. Sprinkle some fancy salt flakes over the top of the cookies. This is the best part because it makes them taste incredible and you get to be #saltbae for a minute which also cool.. These are honestly really easy cookies to make. In fact, even with this fantastic photo shoot, the whole process only took like 30-45 min, and most of that was spent making sure my weirdly chubby fingers appeared normal looking. 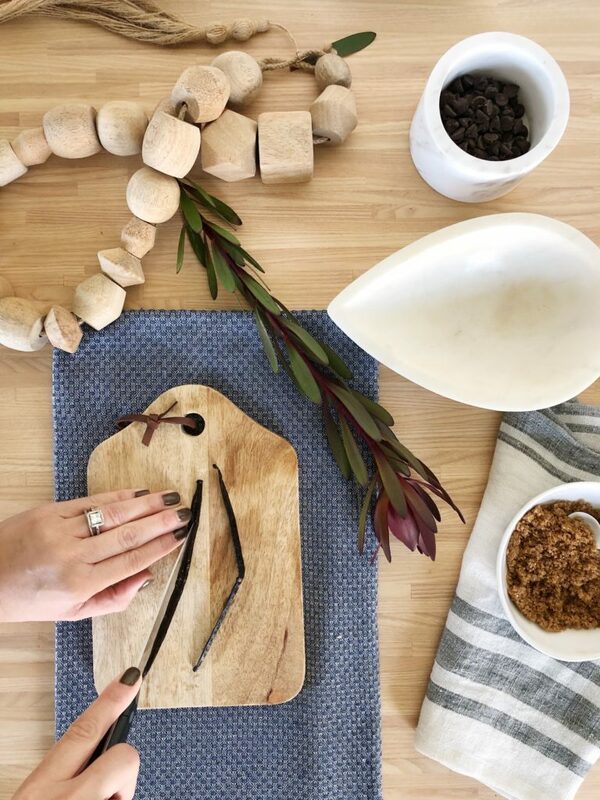 Sidebar- how rad is my countertop? 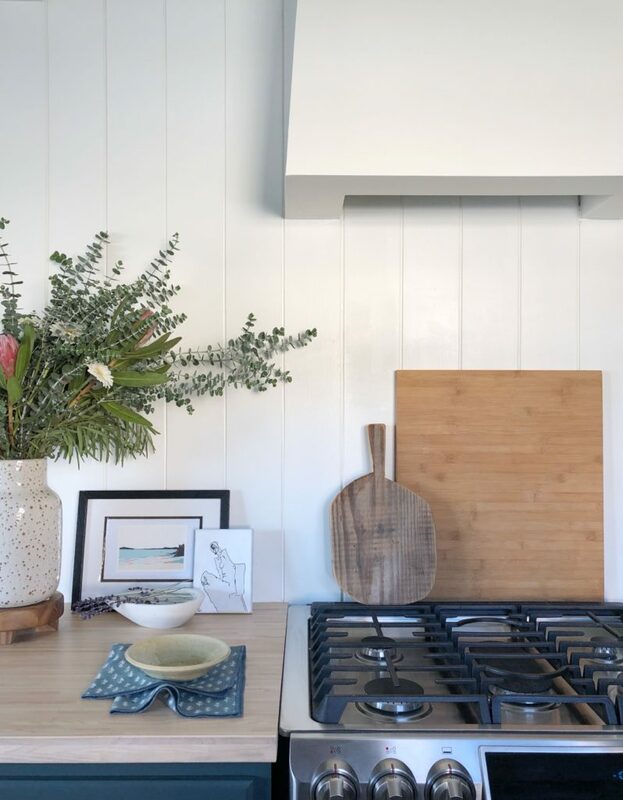 It’s an ash wood butcher block I bought from IKEA and it really warms up the kitchen and is the perfect contrast the cabinetry. Since I am sure you will ask, the backsplash is vertical wood paneling, but don’t stress, I never cook so it doesn’t get dirty. Hood is drywall/flat paint, and hardware is from Lewis Dolin. Cabinets are just the existing cabinets in our sweet 1941 beach cottage that I had painted since we’re working on plans to build a new house on this lot in a few years. Until then I am really digging my little budget-friendly facelift, and the sweet backdrop it gives my fab cookies. Making It Lovely, Centered by Design, Bria Hammel Interiors, Place St Russell, Anita Yokota, Simply Grove, Room for Tuesday, Francois & Moi, Life on Virginia Street, Boxwood Avenue, Coco Kelley, Erin Kestenbaum, House of Hipsters & Jojotastic!